After depicting the 'Cash for Clunkers' car buying program as a "runaway success" on Friday, on Tuesday's Early Show, correspondent Nancy Cordes argued: "The Department of Transportation says the program has been great for the environment. 80% of the clunkers have been pickups or SUVs, traded in for new cars with an average mileage nearly 10 miles per gallon higher." Following that declaration Cordes cited car salesman Mario Sosnowski, who praised the program: "Starting from 8:00, 9:00 in the morning, we're here till - till midnight every day because of the program, because of the excitement." At the top of the show, co-host Julie Chen depicted Republican opposition to increased funding for 'Cash for Clunkers' as a desire to "put the popular program on the scrap heap." Following Cordes' report, co-host Maggie Rodriguez asked South Carolina Senator Jim DeMint about his objections: "We now see this morning that this program is, in fact, getting more fuel-efficient vehicles on the road. It's getting people to spend money. So do you still believe, as you have said in recent days, that this is quote 'a great example of the stupidity coming out of Washington'?" Rodriguez then turned to the topic of the confirmation of Supreme Court nominee Sonia Sotomayor, attempting to portray the liberal judge as a moderate and Republican opposition to her appointment as unfounded: "I've been reading up on some of your objections to her nomination, and you cite concerns over whether she will uphold the Second Amendment, yet she is supported by a senator who has a perfect rating with the National Rifle Association. You say that she's pro-abortion, but even Rush Limbaugh, I remember back in June, said that her record on abortion is not clear. What is your biggest objection to her nomination?...Do you think that her record has been a record of an activist?" DeMint responded: "...she's been evasive on a lot of questions....She seems more founded in precedent than in upholding the Constitution....she has not been consistent in her comments and seemed very evasive with me in the individual meeting that I had with her." JULIE CHEN: Has 'Cash for Clunkers' finally hit a roadblock? We'll talk to one senator who wants to put the popular program on the scrap heap? MAGGIE RODRIGUEZ: Now to the fate of the 'Cash for Clunkers' program. Automakers say it's been great for them, but some lawmakers say not so fast. 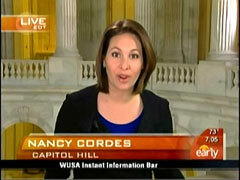 CBS News transportation correspondent Nancy Cordes is in Washington with the latest this morning. Good morning, Nancy. NANCY CORDES: Good morning, Maggie. That's right. Senators who oppose 'Cash for Clunkers' want to get the chance to debate this before they vote on it. $2 Billion, after all, isn't chump change. With the 'Cash for Clunkers' program running on financial fumes and only four days left until a four-week recess, Democratic senators are urging their colleagues to vote to grant the program another $2 billion. CHARLES SCHUMER: Bottom line is, if it ain't broke, don't fix it. It's working in every way. What we need to do here is not put on the brakes, but step on the gas. CORDES: The White House says without an immediate injection of funds, 'Cash for Clunkers' could be scrapped any day now. ROBERT GIBBS: If it doesn't happen this week, it's unlikely that we'll make it to the weekend with a program that - that can continue. CORDES: The Department of Transportation says the program has been great for the environment. 80% of the clunkers have been pickups or SUVs, traded in for new cars with an average mileage nearly 10 miles per gallon higher. MARIO SOSNOWSKI [CAR SALESMAN, GOLF MILL FORD]: Starting from 8:00, 9:00 in the morning, we're here till - till midnight every day because of the program, because of the excitement. CORDES: Congressional aides say a deal is in the works to hold a vote on more funding for 'Cash for Clunkers' as early as tomorrow or Thursday. 60 Senators would need to vote yes in order for the program to keep going, Maggie. MAGGIE RODRIGUEZ: Nancy Cordes. Thank you, Nancy. We know one senator who will be voting no. Republican Senator Jim DeMint of South Carolina has been an outspoken opponent of the 'Cash for Clunkers' program, and he joins us now from Washington. Good morning, Senator. RODRIGUEZ: We now see this morning that this program is, in fact, getting more fuel-efficient vehicles on the road. It's getting people to spend money. So do you still believe, as you have said in recent days, that this is quote 'a great example of the stupidity coming out of Washington'? RODRIGUEZ: I also want to ask you about the nomination of Judge Sonia Sotomayor to the Supreme Court, which you will begin debating today. I've been reading up on some of your objections to her nomination, and you cite concerns over whether she will uphold the Second Amendment, yet she is supported by a senator who has a perfect rating with the National Rifle Association. You say that she's pro-abortion, but even Rush Limbaugh, I remember back in June, said that her record on abortion is not clear. What is your biggest objection to her nomination? RODRIGUEZ: Do you think that her record has been a record of an activist? DEMINT: We have some problems with a number of her decisions, particularly on Bill of Rights questions such as the Second Amendment. The decision that she made about the firemen was questionable. A lot of her speeches suggest that she has a different idea of what a justice should do. But she had some confirmation conversions, and she came back to the point of view of a constructionist type of judge. But she has not been consistent in her comments and seemed very evasive with me in the individual meeting that I had with her. RODRIGUEZ: Senator Jim DeMint, thank you very much for your time this morning. DEMINT: Thank you. Good to be with you.